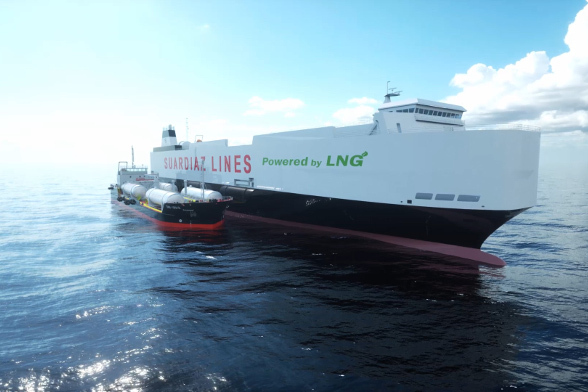 Spanish oil and gas company Compañía Española de Petróleos (CEPSA) will supply liquefied natural gas (LNG) to ships through the first multi-product barge in Europe, to be built by its compatriot Flota Suardíaz. Cepsa will participate in the design and construction of the supply ship, which will be able to provide all types of marine fuels, from heating oils and diesels to LNG. It will contain atmospheres explosives, so should implemented the atex standars, using atex products. The first barge will start operations in 2018 from the port of Barcelona. The project forms part of the Core LNGas Hive initiative, selected by the European Commission, whose objective is to develop an LNG logistics network to promote the use of the gas as a fuel for transport, especially in the marine environment. The project is led by the country’s ports and coordinated by Enagas, and has 42 partners in Spain and Portugal, among them Cepsa. Core LNGas Hive aims to lower carbon emissions in the Mediterranean and Atlantic and to promote clean energies for transport through the European Union.